Every year we spend almost a million pound clearing up street litter. People can now be fined £80 if spotted dropping litter. See our FAQ about fines we can now issue. Litter not only makes a place look untidy, but it can pose a number of hazards to people. There are plenty of litter bins across Tamworth - please use them or risk facing a fine. It includes: General household waste, fridges, sofas, mattresses, garden waste, commercial and industrial waste. 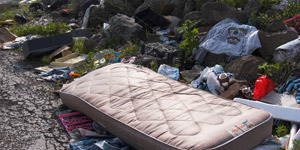 It costs the the taxpayer approximately £150,000 a year to clean up fly-tipping. Basically it is waste tipped on land which does not have a waste management licence. A county-wide campaign has been launched by representatives from all of the local councils, Staffordshire Fire and Rescue Service, Staffordshire Police, the Environment Agency, the DVSA and Highways England to address the problem. Find out more from this 'Staffordshire Prepared' News Release. The Right Place website gives more information about correctly disposing of waste. It is a serious criminal offence. Anyone - including householders - can be prosecuted under the Environmental Protection Act 1990. The maximum penalty is £50,000 fine and/or twelve months imprisonment. However Crown Court prosecutions can lead to unlimited fines and/or imprisonment of up to five years. Dumped hazardous waste such as asbestos can lead to a prison sentence of up to five years. Fly-tipping from vehicles can see the owner of the vehicle prosecuted. The police have the powers to seize vehicles. Select this link for more information on Environmental Crime Enforcement Policy. You can dispose of extra waste at household recycling centres. Glass, paper and drinks cans can be recycled in your weekly blue box collection or at recycling centres. If you are a householder, you can dispose of bulky items such as unwanted furniture, old cookers and fridges, carpets and scrap metal goods for a small charge. The day, date and time you saw the tipping. We will: Inspect the dumped materials, arrange for removal, collect evidence and interview any suspects. If we collect sufficient evidence, we will prosecute the offender through the criminal courts. Please do not confront the fly-tippers and put yourself at risk. To report fly tipping call telephone: 01827 709709. You may be asked to make a written statement about what you saw. You can also report the details using the online Report It form.